A peek into the life of Grace Poe shows us about familial secrets, treacherous lies and redeeming truths about her origin. Her story had captured the hearts of many back in 2013, yet this same story that endeared her to the nation may now be used to counter her actions if she files candidacy for President in the 2016 elections. 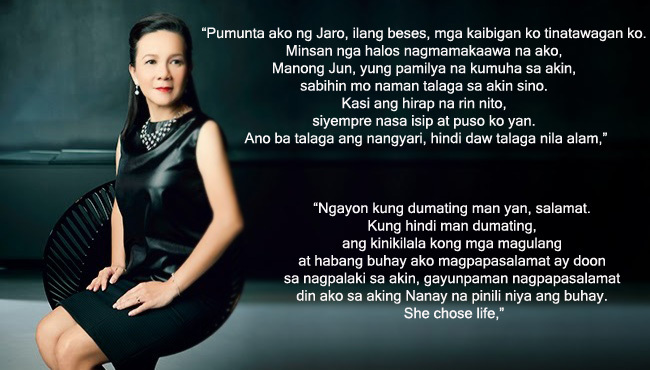 Grace Poe’s life can be compared to a fiction novel that jumps right out of the book. She was abandoned as an infant at the Jaro Cathedral in Iloilo in 1968. She was raised by many individuals who have gradually shaped her and her life. Senator Grace Poe was brought up by nanny Sayong Militar then, passed under the care of Tessie Ledesma Valencia, a sugar heiress. She was later adopted by then, one of the most famous couples in the showbiz industry, Susan Roces and husband, Fernando Poe Jr. However, this touching tale of hers may be used against her. According to Christian Monsod, a member of the 1986 Constitutional Commission, the Constitution states that only natural-born Filipinos may become President, Vice President, Senator and Congressman of the nation. With her origins uncertain and her parents unknown, the Filipino may, or may not, be natural born. For nearly 47 years, information about the senator’s biological parents has surfaced but their identities remain unknown. Those who came forward, said Poe, were found to be fraudulent. Carmela Ledesma, niece of Tessie and friend of Sayong, claims that Poe’s father is Ilonggo. She said that, although she does not know the name, Sayong told her the Father is Filipino, who by the time of Poe’s birth, could not afford the expenses of raising a child. She knows nothing about the mother. Sayong, aged 89, is now living in Canada while Tessie Ledesma Valencia passed away last 2009. Poe calls her first home the yellow house on Sta. Isabel Street owned by Sayong’s family. When she was nearly two, Sayong’s son Jun said she became a ward of Tessie, a relative of Sayong’s employers. Sayong managed to convince Tessie to take care of Grace as Tessie was orphaned, unmarried, childless and had no siblings while Sayong still had five children to feed. Tessie, then, took young Grace to Manila to live on the Ledesma mansion of Taft Avenue. They also lived at the San Juan, Greenhills where Tessie’s friends, Susan amd FJP, lived. The couple, during this time, grew fondness and attachment to Grace. A judge from San Juan signed the order to formalize her adoption when Grace was nearly six years old and Tessie eventually migrated to the US leaving the young lady to grow up with Susan and FPJ. Even though Poe’s citizenship was unquestioned during the 2013 elections when she ran for public office, political watchers state that running for the Presidential seat is quite a different case. “I’m asking our countrymen, if they know anything about it, please come forward. Not for anything else, not just because of my possible candidacy, but because it’s the right thing to do,” said Poe, hoping to finally find and meet her biological parents.